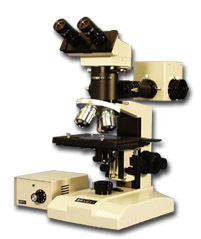 With incident or transmitted light, brightfield or darkfield modes, the ML8500 Metallurgical Microscopes do it all. ML8500 Series models are available in binocular or trinocular with other optional equipment that our dealers can use to tailor a system to meet you particular needs. Available with erect image binocular heads, and non-erect image trinocular heads for photomicrography (erect-image trinocular head optional). All have 30° inclined eyetubes with adjustable diopter settings and interpupillary distance from 52mm to 72mm, 360° rotatable. Infinity corrected S. Planachromat brightfield/darkfield 4x, 10x, 20x, and 40x standard, 60x optional. Flat-top stage: 172mm x 130mm surface with 94.5mm diameter clear glass insert to allow transmitted illumination; 100mm (X) by 100mm (Y) movement, drop-down right-handed coaxial controls. Transmitted illuminator: Built-in 6V 30W halogen, variable-intensity, full Koehler illuminator. Incident illuminator: 12V 50W halogen, variable-intensity, full Koehler vertical illuminator with field iris, aperture iris, and filter slots. Includes clear blue, clear green, polarizing, and neutral density (ND8) filters in mounts. MA275/100 Vertical Koehler Illuminator 115volt, 12V 50W halogen lamp with blue clear, green clear, yellow, ND2 & ND8 neutral density and polarizing filters. Transformer and spare bulb included. MA275/200 Vertical Koehler Illuminator 220volt, 12V 50W halogen lamp with blue clear, green clear, yellow, ND2 & ND8 neutral density and polarizing filters. Transformer and spare bulb included.